Series GX Single Wall Sight Flow Glasses – Plast-O-Matic Valves, Inc. True Blue® Series GX flow indicators are designed to indicate the presence or clarity of liquid in a piping system. For use with ultrapure liquids or chemicals compatible with acrylic. O-ring seals are used on Series GX indicators allowing them to seal at extremely low pressures as well as high pressures. GX flow indicators are full ported, eliminating any possible flow resistance. Pipe sizes are 1/2″ through 3″ NPT. BSP sizes also available. Optional fluttering streamers are available. Ends on Series “GX” indicators are PVC (TYPE 1, GRADE 1 Polyvinyl Chloride) and Polypropylene. Standard O-ring seals are either EPDM or FKM. Standard fasteners are stainless steel. The transparent outer cylinder wall is high impact strength acrylic. Optional fluttering streamers are corrosion resistant thermoplastic. *If fluttering streamers are required, conclude part number with -S; for example: GX050EP-PV-S. If natural polypropylene ends are required, change -PV to -PP; for example: GX050V-PP. NPT threads will be supplied unless BSP threads are specified. When properly installed, Plast-O-Matic flow and level indicators are automatic in operation and require little or no attention. Series GX may be installed either vertically or horizontally; it is simply threaded into a piping system. It should only be connected to plastic fittings. Male threads should be wrapped with PTFE tape or other acceptable pipe sealant and only made hand-tight, followed by a one-quarter turn more using a strap wrench. Greater forces tend to stretch or distort the plastic material which could lead to future rupture. Do not use pipe wrenches, locking channel pliers or vise-lock pliers; all of these create stress in the molecular structure of the plastic. Do not connect to a metal pipe. This could cut into the plastic and also cause a future rupture. Although Series GX has no specific inlet or outlet, care should be exercised when installing such units that have streamers for fluttering devices. They must be installed in such a manner that the fluid flow will force the streamers into the indicator’s viewing area. Clearly, any flow indicator is only as good as the quality of its cylinder wall, since this is where the viewing takes place. The transparent cylinder walls used in all Series GX indicators are manufactured of a high impact strength acrylic. This material possesses uniform optical quality and has an extremely high light transmission factor, which is of great importance when the color or clarity of your liquid is a prime consideration. 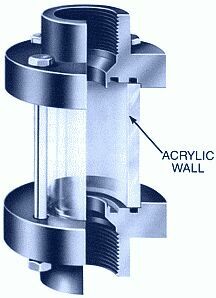 Acrylic cylinder walls are ultra-violet resistant. Series GX can be used to indicate the presence of liquid flow when the liquid lends itself to turbulence or has entrained air bubbles that make viewing effortless. When the liquid is either clear or opaque a mechanical device is required to identify liquid movement. In such applications the use of optional fluttering devices is a necessity. Optional thermoplastic streamers that flutter in the presence of flow are available for Series “GX” flow indicators. The streamers are corrosion-resistant vinyl, and are generally compatible with liquids that are compatible with PVC. As specialists in thermoplastic sight glass design for over 30 years, Plast-O-Matic’s engineering department can modify Series GX to meet your specific needs…or create an all-new product for any special application. Depending on complexity, minimum quantities and/or design fees may apply. Please contact our Technical Sales Group at (973) 256-3000 for details.